It’s a subtle clue that the next big move in the precious metals sector is going to be downside. 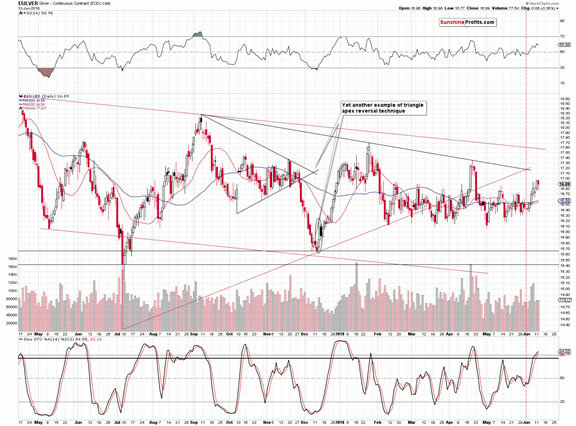 Think about it – silver stocks had an excellent reason to rally – silver moved visibly higher in the past several days. 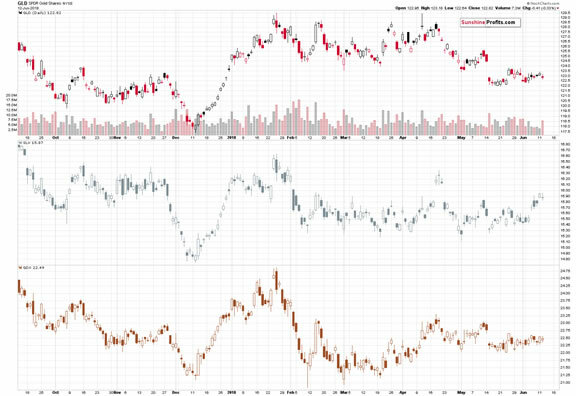 Yet, instead of showing similar strength, the silver miners moved back and forth moving to new lows. That’s a clear sign of weakness. Let’s take a closer look at both markets. The recent move higher is clearly visible in case of silver and it’s clearly absent in case of silver stocks. Since the mining stocks often lead metals and are showing relative strength or weakness as a sign of what’s to come, one should currently be expecting a turnaround in silver rather than in the miners. Of course, if the financial system was destroyed, WW3 broke out etc., then gold and silver would soar, but nothing like that is likely to happen shortly and the above technical rule for the precious metals is likely to apply. As we mentioned earlier, the other noteworthy development was the spike in the GLD ETF volume that accompanied yesterday’s decline. The above is a bearish development, especially that it was preceded by a move higher on low volume. The volume generally rises when the market is moving in tune with its true direction and declines when it moves in the opposite way. 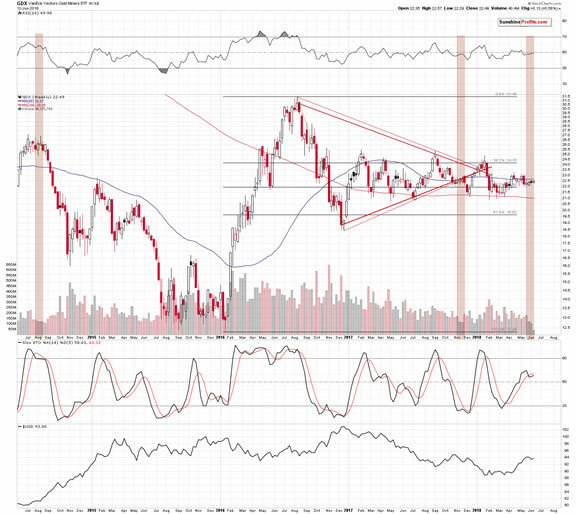 It’s currently clear that the price-volume link suggests that gold is in a downtrend and the last several days of pause is just that – it’s not a prolonged bottoming process. Speaking of volume, let’s keep in mind that yesterday’s volume during the daily upswing was low enough to be a bearish sign on its own. In yesterday’s Gold & Silver Trading Alert, we emphasized that GLD had rallied on what was the lowest daily volume in about 3 months. In the previous year there were only 3 similar cases and they were all followed by the same (or almost the same) kind of action. Declines. In both: late February 2018 and mid-March 2018, gold moved lower immediately after the low-volume upswing and the remaining October 2017 case was when GLD moved lower with a one-day delay. Overall, the implications were bearish yesterday and they continue to be bearish today as we only saw a small decline so far. We can say the same thing about the implications of the volume-based signal from the mining stocks. The signal was based on the past two weeks, but its implications haven’t played out yet. 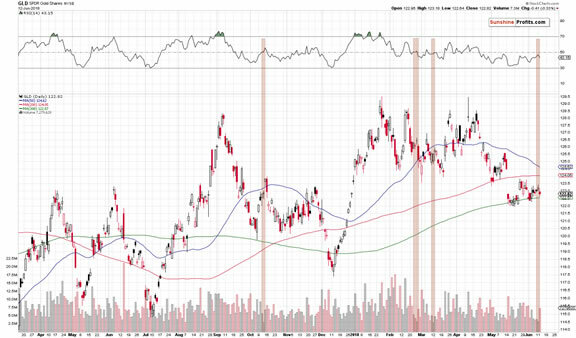 The volume in the GDX was very low in the previous two weeks while the price moved insignificantly higher. There were only two similar cases in the recent past. And both were followed by declines in the following weeks. The November 2017 analogy resulted in about $2 decline, and the August 2014 analogy was followed by about a $10 downswing. 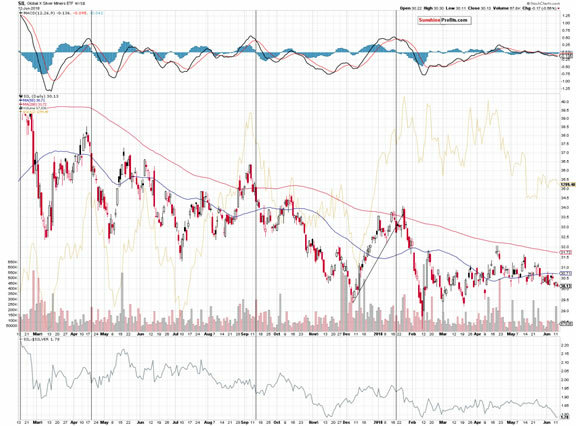 $10 decline from the current price levels would mean GDX at the 2016 low. This may seem unrealistic, but… Well, that’s what we already saw after similarly low volume. To be clear, the analogy is not perfect, because percentagewise the move to the 2016 low would be bigger, but still, any confirmed breakdown below the late2016 low is likely to result in a steep move down, as there’s no technical support all the way to the 2016 low. Just as people were buying like crazy in the early 2016, they are likely to sell like crazy later this year. Before moving to the analysis of the currency sector, we’d like to get back to something that we discussed several weeks ago – the link between gold and stock market volatility. Please feel free to use the above link to read the entire commentary, but in short, quite a few commentators said that gold was about to soar because of the increased volatility in stocks. This seemed believable at the first sight, as gold is seen as a safe-haven asset and thus people could be buying it when the stock market’s movement becomes chaotic, scary and/or unpredictable. Yet, after looking at similar cases in the past and investigating the correlation between gold and VIX (stock market volatility index) it appeared that there were absolutely no reasons to think that the increase in stock market volatility would trigger a rally in gold. Moreover, there were good reasons to think that it would be followed by lower gold prices. We had been short at that time and we closed these short positions at a profit later on. We didn’t feature the above to boast how correct we were and how wrong many other gold analysts (mostly gold promoters, not analysts, though) were, but in order to show you how important it is to stick to cold logic and pre-determined methodology when things get hot. This applies to any market, but it’s going to be particularly important for us – gold and silver investors and traders, as we’re approaching the critical time of the year. When gold drops many tens of dollars in a short period, it will not mean that it is worthless or that it will then be time to enter short positions. The time for it is now – when things are boring before the move. When precious metals investors get scared and throw in the towel, it will be time to consider taking profits from the short positions and to open long ones. But, it will be impossible to do, if one simply follows “hot and emotional news” instead of analyzing the market. We’ll do the latter for you and report accordingly. Summing up, the increase in the GLD ETF’s volume during yesterday’s decline along with a new low in silver stocks confirm the bearish outlook for the precious metals market. Since the outlook had already been bearish, nothing really changed based on yesterday’s session. While the decline may not start immediately due to the tension connected with this week’s monetary authorities’ meetings, the outlook remains bearish and once the dust settles, PMs are likely to decline. It doesn’t seem that we’ll have to wait much longer though as there are only 3 sessions left until the end of the week, including today’s one.